On Monday night I popped along to Kingston to see a fantastic family circus themed show at The Rose Theatre. I can safely say that The Snow Gorilla will wow the kids this Christmas! I wasn't sure what to expect before we went along, I purposely hadn't looked into the show too closely as I didn't want to have any expectations. Any expectations that I did have were exceeded though as the show just kept giving. The Snow Gorilla is set in a travelling circus, Circus Marigny where the Ring Mistress, Fanny Marigny is struggling to keep the circus going due to dwindling funds and a thief in their midst. Along comes Sunny, a runaway looking for adventure and that's definitely what he gets, along with a romantic dalliance with the ring mistresses daughter Chloe. He discovers The Mighty Gor hidden in a cage in the circus and strikes up a beautiful friendship with him. Sunny unwittingly becomes the suspected thief within the circus, but between him and Gor they trap the real criminal and restore happiness to all. What is brilliant about this show is throughout the story the audience gets to see all the circus acts as they practise for their performance, so we were treated to African acrobats, Flamenco dancers, a contortionist, a juggler and an aerial act. My favourite were the African acrobats, they had such energy, the musicians that played along to their act really got the audience into it. They were massively entertaining, showing skill and humour every time they appeared. I also thought the aerial act was amazing, but just a word of warning if you're in the stalls downstairs at the back you may struggle to see them as they are high up. I craned my neck to make sure I saw all of their daring act. Now I have to mention how brilliant the Gorilla is! He is voiced by Brian Blessed who is someone I absolutely love. I couldn't imagine anyone else voicing him now to be honest. Then the look of Gor is amazing. You can't appreciate how clever the costume is until you read about how the costume was made for the man inside to wear it and how he has to use buttons and levers within the suit in order to animate Gor's face and make movements. The way he moved around the stage was so real to a Gorilla, he shuffled around on his knuckles, he rose up in anger and his face had such expression. The entire cast are fantastic and you can tell that they have a great chemistry. 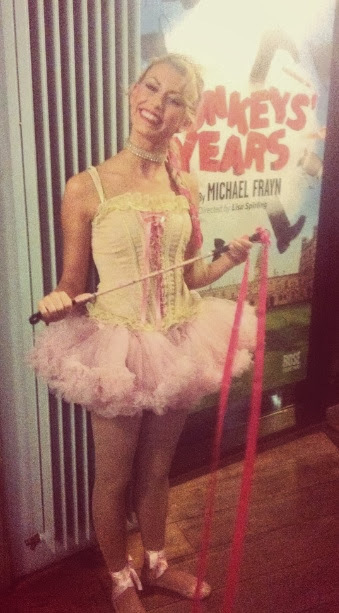 The singing is good, I particularly liked Chloe and was lucky enough to get a snap of her before the show when the cast were circulating amongst the crowd in the foyer. There is a baddie in the show and he got great pantomime treatment from the audience with lots of booing and hissing when he appeared. This show has everything for everyone, great songs, spectacular performances from circus acts, to a show stopping singing Gorilla, a pantomime feel to it and an engaging story. We didn't take the children as it was an evening performance but I wouldn't hesitate to go back with them as I know they would love it. 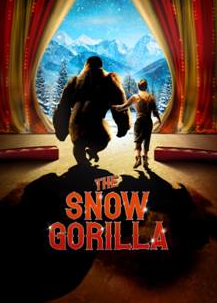 The Snow Gorilla runs until the 5th January 2014 and tickets are on sale now. For more information about the show visit www.rosetheatrekingston.org or call the Box office on 0844 4482 1556. We were given 2 tickets to see The Snow Gorilla in exchange for this review. Thanks for inviting us!